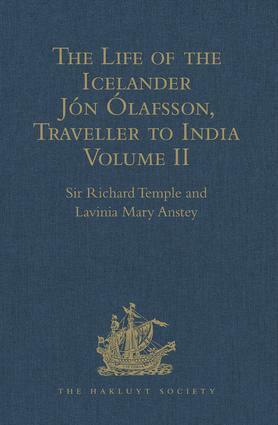 The Life of the Icelander Jón Ólafsson, Traveller to India, Written by Himself and Completed about 1661 A.D. Continued from Second Series 53. Translated from the Icelandic edition of Sigfús Blöndal. This volume covers his life and travels, 1618-1679: Denmark, England, The Cape, Madagascar, Comoro Is., Coromandel Coast, Tranquebar, St Helena, Ascension Is., Ireland, Iceland This is a new print-on-demand hardback edition of the volume first published in 1932. Contents: Prefatory note; Introduction; Text; List of works referred to in the notes; Index.